"Wear one's heart on one's sleeve" – this is the best summary of the Sagittarian characteristic. It's a good-natured archer who arouses respect and embarrassment at the same time. They are not spiteful, but their flippancy and sincerity can disarm many people, even friends. When Sagittarius will shoot the arrows around, he or she will smile while your laugh will probably be soon over. To better imagine his / her common attitude – Sagittarian statements correspond with the straightforward ability to aptly, but often also tactlessly comment everything around, eg . : "Today you look much better than last time, that you had greasy hair and the old turtleneck. You are really making progress!" or "Have you finally got to the school? I think you will be completely gray before the graduation." or "The egg spread is really good. Hopefully breeders got rid of the salmonella which was last year still widespread." Sagittarius often jumps to conclusions. They can spew many shocking judgments and look totally innocent. It's often really strange how so clever person can be sometimes blind to own statements. And yet these archers often believe that they are the greatest diplomats under the sun! Unfortunately the Wild West saying "shoot first, ask later" is more appropriate by them. But you will never be angry with them when they apparently lack the malicious intent. Sagittarians are usually self-confident people who despise conventions. They refuse to accept the seriousness of life. They are bold and they seek the adventure or even some danger because their element is fire. 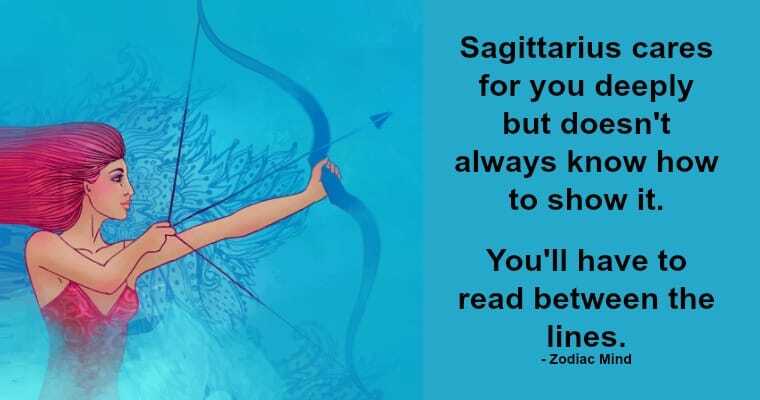 Therefore also Sagittarians are usually extroverted. Those who live in seclusion, you will find only sporadically, but those archers often have fantastic dreams and high aims. They are not hopeless dreamers. They will present their plans to others only when they are confident of success. If some Sagittarius becomes a hermit for a short time, it is usually a very good opportunity to sharpen his / her wit to absolute brilliance.